Our custom mascot design services are included free of charge. 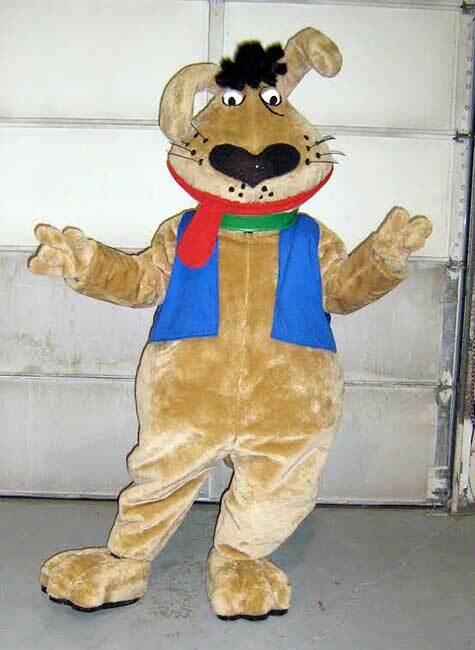 Our creative staff will work with you until you are satisfied with the rendering of your mascot costume. At Custom Mascot, all of our character designs are originals and we guarantee never to reproduce them for any other client. Only the finest quality and most durable materials are used in production at Custom Mascot! Unibody style mascots are when the body and head are together as one unit. The positive design aspects of a unibody are they stand out, and they a wide range of performers. They have a wider range of vision as the performer is generally close to the vision hole. They are easy to care for as the arms, legs and gloves go in the washing machine easy. This mascot has the logo on both the front and back of the mascot. A fan system is installed on the top inside the head head part so it circulates air on the performers to help keep them cooler. 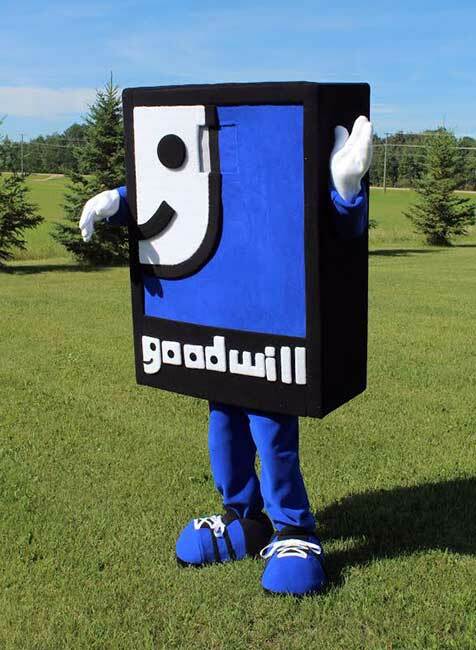 It was important to Goodwill to have their logo come to life. That is why for them the unibody style mascot was the best way to do that. Company mascots are a great way to get your message out. 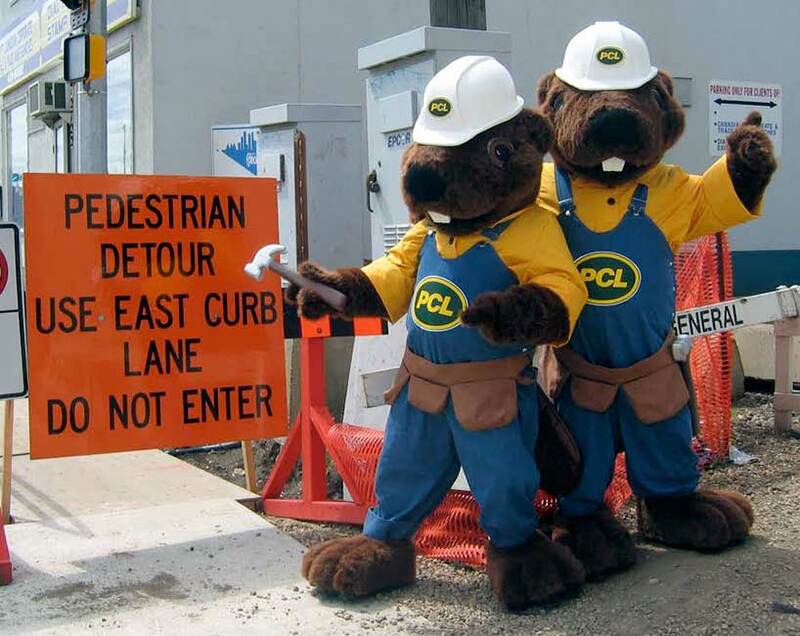 PCL got these mascots to promote company safety as well as company team work and community. Every detail was coordinated with the design team at PCL they provided us with the specifications as to what they needed. These mascots come with a hard hat that is removable, vision in the nose, air vents in the eyes where the fan is mounted. Full fur body shirts, overalls and tool belt are custom made for an exact look and fit. The feet are double treaded for use in all areas inside and out. The hands are fully functional so they can shake hands, sign cards, hold tools and interact with the audience, ideal for trade shows, parades and company functions, as well as community functions. They pack up small and can be shipped with ease to any event. The fan systems no longer a re made to run on the big heavy 12 volt batteries of the past where chargers were getting lost. Now we made our fans to run on 8 AA batteries that makes the heads very light and easy to wear. 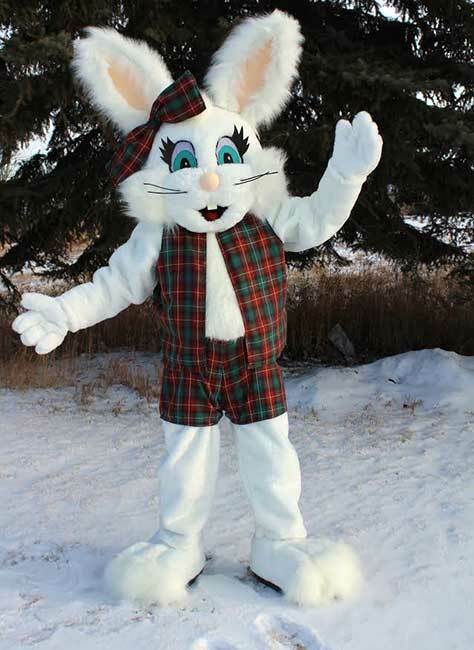 What fun this bunny is in her tartan outfit. Custom mascot specialized in cute. This mascot has a combination of long 4 inch fun fur, short deluxe fun fur, and a tartan outfit that is removable so they can dress him up in all kinds of outfits for all kinds of events. All our furs come directly from a Mill in the USA and are 100% Polyester NO animal fur is in any of our products.This body has a removable inside chest form this helps retain the shape and look of the mascot no matter who is inside and allows for a wider range of performers. The large eyes also provide a greater vision. We often get asked to make eyes smaller, put vision in an area where it is not going to provide good vision. What school would not benefit from team spirit and school pride. The dogs’ name is Spike and it was our delight and honour to bring him to life for her. Custom mascot has created hundreds of mascots for Colleges, High Schools, Jr. Highs, Elementary and Trade Schools. Wear your school mascot with pride. This mascot has vision in the nose, a harness head because of the shape of the head we made a harness system so that no pressure is put on the performer head or shoulders with the large head, it also allows for complete control of the head when moving around. The metal hoop on the front on the collar allows them to add a nice dog tag. The body has a inner large body that has hoops to give him that wide bottom look. His bottom wiggles as he walks making his tail move. with our unique waffle tread they can safely wear him on any gym floor knowing he will never leave a mark on the floor. We give all schools a $1,000 discount on their mascots as we are firm believers all schools should have a mascot that is safe, comfortable, and a pride of the school. ALL OUR FUN FURS ARE ANIMAL FREE 100% POLYESTER, MACHINE WASHABLE, MANUFACTURED IN USA, NOT OVERSEAS. All our work is done in house in Canada.